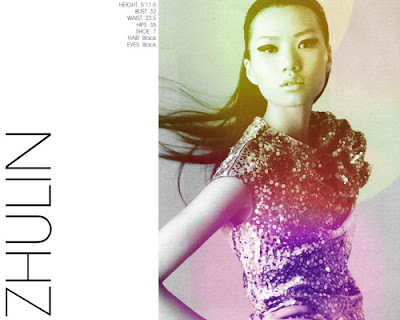 According to Models.com, newbie model Zarina is of Mongolian descent and speaks fluent Russian. 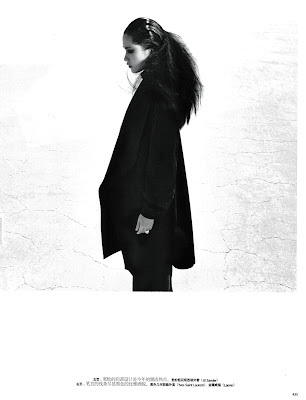 She is currently signed with Muse Agency in NYC. 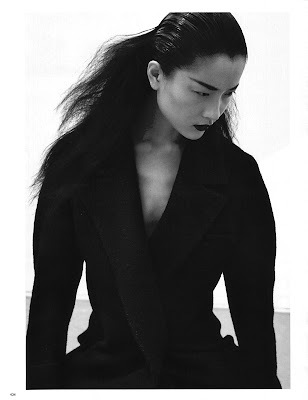 Personally, I think it is exciting to see an Asian model from other countries aside from China, Japan or South Korea. Of course, there are also Asian models from US, Canada, India, Malaysia, Singapore, Indonesia and the Philippines. Another Asian face with an interesting origin/lineage is Eugenia Manzhieva who is of Manchurian descent and Russian nationality, as is fellow Russian model, Dinara Chetyrova. 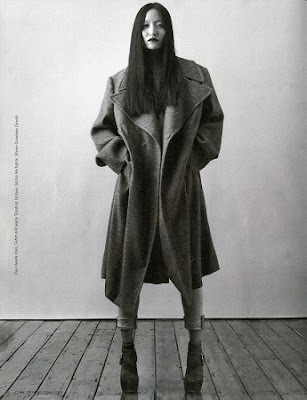 Then there is Irina Pantaeva who was one of the most visible Asian faces in the 1990s. She is of Eskimo/Mongolian mix from Russian too. Brazil, with its huge ethnic Chinese and Japanese population, has also spawned some familar Asian faces like Juliana Imai, Aline Nakashima and Aline Serpa. Philip Huang is probably the top Asian male model working in the international scene today. Unfortunately, the visibility of Asian male models has not caught up to the popularity of the female counterpart. Nonetheless, it is refreshing to see him still working even if it is for Macy's. 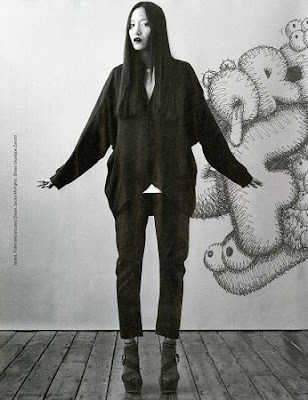 Here is Sonny Zhou in the new Nordstrom Designer Book Catalog out in August 2008. This book is a premier edition of the regular Nordstrom catalogs and it only showcases the works of top designers around the world. 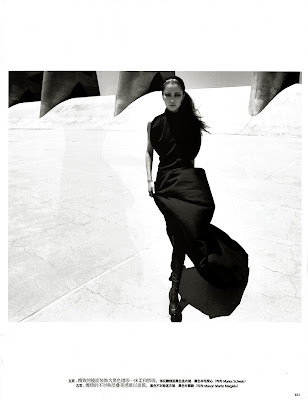 Du Juan is back for her 4th year at the New York Fashion Week. Her last season in NY, Milan and Paris were showing signs of waning but with three major ad campaigns in the pocket this Fall, expect to see her bounce back to the top of the heap. 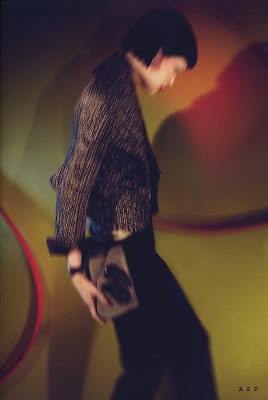 Notable absence this season on the IMG roster is Emma Pei who did remarkably well in S/S 2007 and F/W 2007/2008. Taking her place is a new Chinese girl (6' tall), Zhu Lin who recently defected from Women to IMG, and was promptly added to the agency's show package. 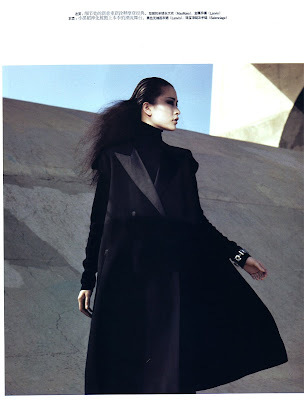 Taiwanese model, Jeanine Chin is the new face of Vivienne Tam, Fall 2008/Winter 2009. 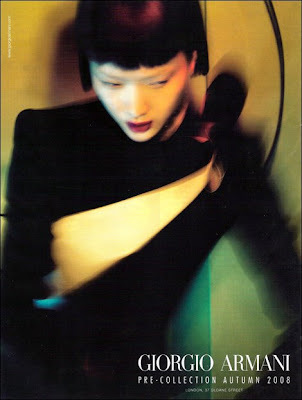 Vivienne Tam, a New York-based designer from Hong Kong, has always used Asian models for the ads. 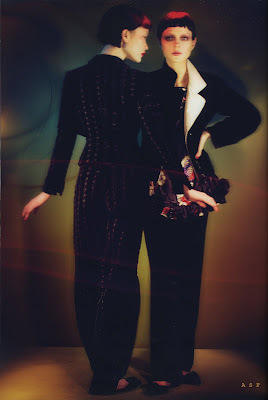 Former Vivienne Tam models include Ai Tominaga and Angie Hsu. Du Juan is probably one of the hardest working models today with back-to-back editorials for China Vogue and a host of other international magazines. 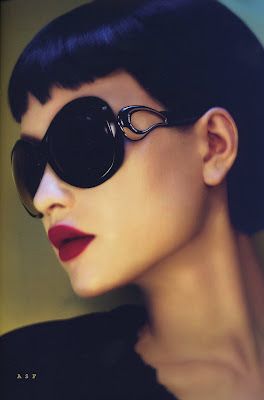 I hope she would pull back a little to avoid getting over-exposed, much like Agyness Deyn did. 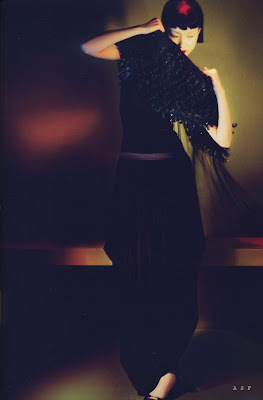 But then again, Agyness Deyn is just as famous for partying as she is of her fashion editorials and ad campaigns. 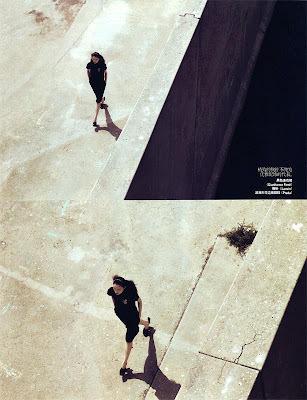 I think this is one of the best editorials by China Vogue. Good job everyone!! Anne Watanabe has been a regular at the New York Fashion Week since the Spring/Summer 2006 season. 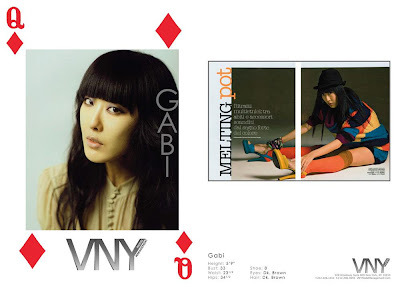 She has walked for some of the most influential designers from Marc Jacobs to Anna Sui. Look for her in more shows this season. 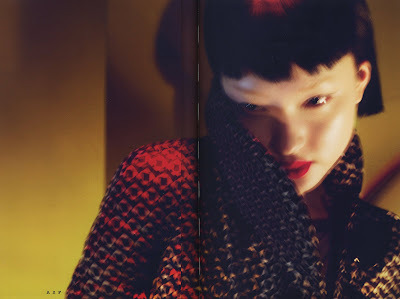 Here is an editorial of Daul Kim on British i-D Magazine, July 2009 with her characteristic angry look. This editorial included an interesting interview on the last page (click to enlarge). She said she was born in Seoul, Korea but was raised in Malaysia and went to school in Singapore. 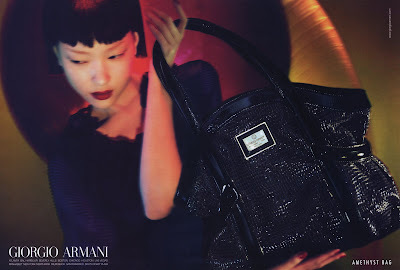 Update: Here are more photos from the ad campaign with Du Juan in Giorgio Armani, Fall 2008/Winter 2009.